The next retreat as part of our Syllabus III programme, entitled 'Labours of Love' is hosted by programme partner Eastside Projects, Birmingham. Please note that we have selected the artists for this year's Syllabus III programme. 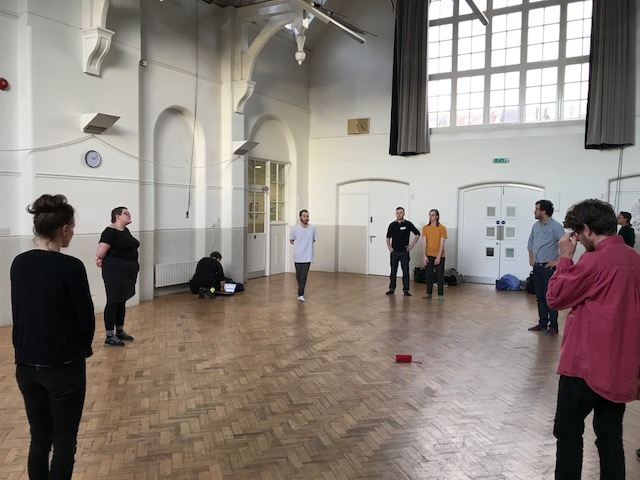 Syllabus III artists Frederica Agbah, Chris Alton, Conor Baird, Ilker Cinarel, Phoebe Davies, Freya Dooley, Rose Gibbs, Jill McKnight, Ben Sanderson and Karis Upton are visiting Birmingham for their fourth retreat, hosted by Eastside Projects, entitled 'Labours of Love'. The artists will attend New Art Gallery Walsall's exhibition openings for 'Wilderness' – a group show curated by Zoe Lippett; 'Artists Rooms: Vija Celmins'; and 'Mike Nelson: Lionheart'. Don’t make art by yourself. Make it with others. From others. For others. Part 1 - A series of active, collective discussions, led by Syllabus participants beginning with a focussed question or proposition for the group to discuss, unpick or unravel together. Workshop: Scuola Senze Fine (School Without End) - Led by Syllabus III artist Rose Gibbs, this workshop takes the film Scuola Senze Fine as a starting point to explore friendships between women and the practice of finding a voice and narrating the self. Scuola Senze Fine was a peer led alternative education program that emerged out of the adult education courses provided to factory workers and housewives in Italy in the 1970s. Many of the women had left school at 15 or 16 and these courses provided them with the opportunity to form new friendships and enjoy education for education’s sake. The artists will explore the political context of the film through a number of texts and do a short practical exercise in the method of consciousness raising as developed by The Milan Women’s Bookshop Collective. In the evening is Digbeth First Friday with openings across the area. More info is available here. Breakfast reading group led by curator Lucy Lopez - Text: Exhaustion and Exuberance: Ways to Defy the Pressure to Perform by Jan Verwoert. This will be a slow reading group. This is as much to engage in reading it together and speaking out loud as anything else, and to take away the pressure of having something thought through to say: it's more about immediate reaction and figuring it out together. Don’t make art by yourself. Make it with others. From others. For others. Part 2. The afternoon sees a writing workshop of wild figuring led by artist Holly Pester. Attraction and terror. Trembling and wonderment. Strangeness and intimacy. Only the sacred phenomenon of love can still give us an idea of what that solemn encounter can have been - Aimé Césaire from Poetry and Knowledge. In Holly's workshop we will encourage the quirks, fascinations, obsessions and curiosities that haunt and propel our work like musical microbes, to speak. Our aim will be to open out our thought processes by considering them through experimental analogs, in order to translate what we desire to know, into method. This work might be seen as a de-professionalising turn from writing in order to pay a debt to our research objectives, to a nervous labour of writing that’s an augury of idea and feeling. In other words, rather than claim the objects that fascinate us in our writing – by directly writing about them– how might we translate our fascinations into style and voice, therefore becoming both politically situated by, and in fantastical relation to, our materials. Dinner with invited guests will round out the evening. Rabimmel, rabammel, rabum: Rosalie Schweiker and Sofia Niazi workshop. Rosalie Schweiker has invited Sofia Niazi to join her in delivering this workshop, which will be about professional, unprofessional and semiprofessional representations of artistic work. What is the difference between presenting your work on a website, on instagram or in a zine? And what would happen if your smart statements PDF got turned into absurd paper lanterns? A final reflective/planning session with lead artist Harold Offeh. Please note that we have selected the artists for this year's Syllabus III programme. To receive information on the next round of Open Calls for this and other programmes at Wysing, please subscribe to our e-bulletin, click here.